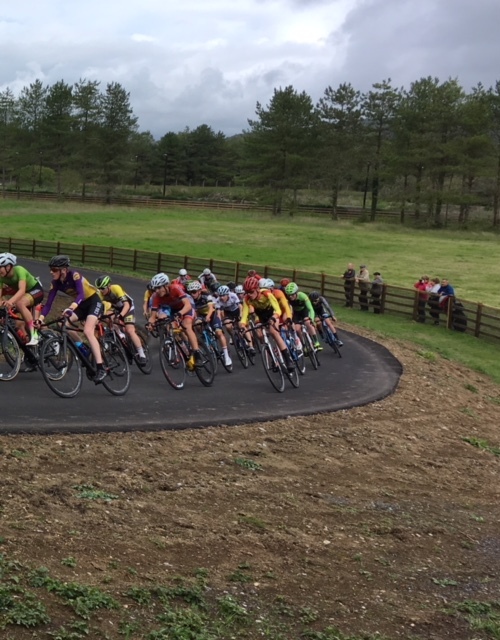 George Pittock’s mixed fortunes continued with frustration and worry at the latest round of the British Cycling Youth National Circuit Series at Pembrey in West Wales on Sunday. The brand new circuit, which hosted the Tour of Britain grand depart only six days earlier, is 1.7km long, fast and flowing with a short, sharp climb and fast descent, and George made the 250 mile trip full of confidence. Blustery conditions made it difficult for any rider to make a clean and convincing break but Oscar Nilsson-Julien of VC Londres always looked the most likely and went on the offensive several times. George looked comfortable in the bunch and started to move up with 10 of the 28 laps remaining. With four laps left, George was in seventh place and looking good for a top 10 finish and his best ever result at a “national”, but then his race ended suddenly. George was taken to hospital with concussion and some memory loss. He was given the all clear several hours later after a CT scan and a thorough check but he still cannot remember anything about the crash itself. Friends told him afterwards that two riders went down in front of George and he went over the top, flew through the air and landed on his head. “The last thing I remember was looking at some of the other boys around me and feeling quite good” said George “I don’t remember going down or how the crash happened or anything at all until I woke up in the ambulance”.